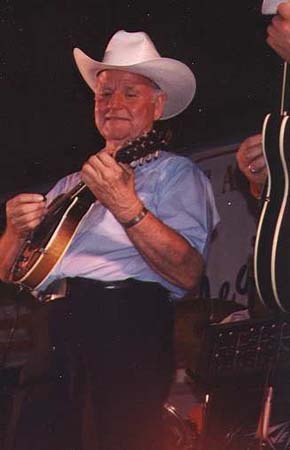 Gimble, a former Bob Wills sideman, is primarily known as a fiddler, but also plays an electrified Gibson A-50 strung as a single-course mandola (tuned CGDA). In the photo on the left, the gentleman behind him is Randy Elmore. Here's more than you wanted to know about Johnny's mandolin: He first electrified it in 1947, while playing in Austin with Jesse James and His Gang, by adding a Montgomery Ward pickup. Later, in 1949, he had Leo Fender himself install a new pickup—a custom bobbin with four posts, along with volume and tone controls—for $15. That pickup lasted until 1969, when the winding broke and pedal steel player Shot Jackson rewound it. In the mid-1980s it went bad again, and Gimble had it restored by Joe Glaser in Nashville. He also replaced the original bridge with a Tune-O-Matic style bridge. (Thanks to Buddy McPeters for the foregoing information.) Here's a closeup of Johnny and his axe.